Dr. Wenzel and some members of our Asthma Institute Team attended Cameron Heyward’s annual birthday party with some special kids from Kids Voice. Celebrating these kids with dinner, gifts, and Dave & Buster’s game time, this event is wonderful for everyone involved. 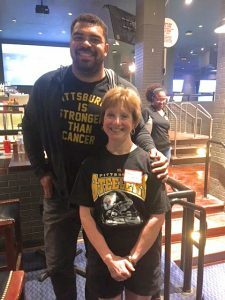 The Cameron Heyward Foundation gives back to the community in so many ways, read more about them and Cameron’s asthma story here.